It was in Los Angeles in 1941 that Carl Karcher and his wife, Margaret, found a hotdog cart on Florence and Central for sale for $326. They borrowed $311 on their Plymouth, added $15 of their own, and bought the brightly colored stand. Although the sign on this first stand read "Hugo's Hot Dogs," Karcher began purchasing more carts, painting on them "Carl's Hot Dog's." In 1945 Karcher opened his first drive-thru restaurant, which he named "Carl's Drive-In Barbecue." In 1956 he opened two smaller restaurants in Anaheim and Brea, California, and used the Carl's Jr. name for the first time. With 630 units as of 1991, the chain's trademark smiling star can be seen throughout the West and Southwestern United States, as well as in Mexico, Japan, and Malaysia. The chain has come a long way from the days when Karcher used to mix the secret sauce in twenty-gallon batches on his back porch. Carl's Jr. takes credit for introducing salad bars to fast-food restaurants back in 1977. Today, salads are regular fare at most of the major chains. Carl's top-of-the-line hamburger is still the flame-broiled Famous Star, one of several products that has made Carl's Jr. famous. 1. Preheat your barbecue grill on high. 2. Toast both halves of the bun, face down, in a skillet over medium heat. Set aside. 3. Cut each of the onion rings into quarters. 4. Mix the ketchup and relish together. This is your "secret sauce." 5. Form the ground beef into a thin patty slightly larger than the bun. 6. Grill the meat for 2 or 3 minutes per side. Salt lightly. Menu Description: "Our famous Original cheesecake recipe! Creamy and light, baked in a graham cracker crust. Our most popular cheesecake!" Oscar and Evelyn Overton's wholesale cheesecake company was successful quickly after it first started selling creamy cheesecakes like this clone to restaurant chains in the early 1970's. When some restaurants balked at the prices the company was charging for high-end desserts, Oscar and Evelyn's son David decided it was time to open his own restaurant, offering a wide variety of quality meal choices in huge portions, and, of course, the famous cheesecakes for dessert. Today the chain has over 87 stores across the country, and consistently ranks number one on the list of highest grossing single stores for a U.S. restaurant chain. Baking your cheesecakes in a water bath is part of the secret to producing beautiful cheesecakes at home with a texture similar to those sold in the restaurant. The water surrounds your cheesecake to keep it moist as it cooks, and the moisture helps prevent ugly cracking. You'll start the oven very hot for just a short time, then crank it down to finish. I also suggest lining your cheesecake pan with parchment paper to help get the thing out of the pan when it's done without a hassle. This recipe is so easy, even a 2-year old can make it. Check out the video. In 1989, Carl's Jr. became the first fast-food chain to allow customers to use their ATM cards to make purchases. Not only can customers buy a Western Bacon Cheeseburger and fries to go without using cash, they can get cash back out of their account. Onion rings, bacon, American cheese and tasty barbecue sauce combine to make a manly gut-grinder that can be thoroughly enjoyed during the grilling season, or any time of the year if you use an indoor grill. The sandwich was introduced in 1983, and has since become so successful that it has spawned variations, from a junior version to the monstrous double, both of which are included here. While any barbecue sauce you use for this recipe will work just fine, track down some Bulls-Eye Hickory Smoke flavor barbecue sauce if you want the closest cloned results. This recipe makes one sandwich. Double, triple, and quadruple it as needed based on current hunger requirements. This recipe also includes clones for the Junior Western Bacon Cheeseburger and the Double Western Bacon Cheeseburger. 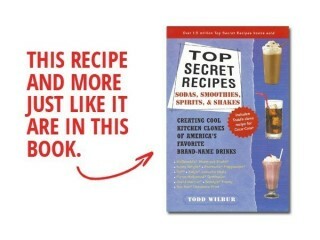 Source: "More Top Secret Recipes" by Todd Wilbur. Nabisco took great effort to produce reduced-fat versions of the most popular products created by the food giant. This product loyalty-retaining move is just good business. According to one Nabisco spokesperson, "We want to bring back the people who have enjoyed our products, but went away for health and diet reasons." And that's exactly what we see happening, as customers are now grabbing the boxes with "Less Fat" printed on them. This box says, "Reduced fat: 40% less fat than original Cheese Nips." The process by which M&M/Mars and other candy companies smoothly chocolate-coat their confections is called enrobing. Enrobing was created in 1900 to protect the interiors of the bars from drying out. The process begins when the uncoated centers pass through a curtain of liquid chocolate on a continuous stainless-steel belt. 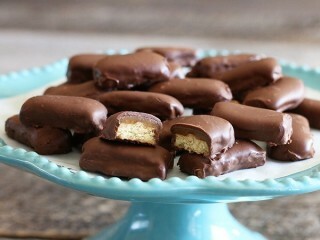 The top and sides of each bar are coated with a thin layer of chocolate. The process is repeated a second time, and then the fully coated bar is quickly cooled and wrapped. Enrobing is the least expensive way for manufacturers to coat their chocolates. At M&M/Mars, the enrobing machines run around the clock to meet the high demand for their products. Unfortunately, traditional kitchen appliances don't include among them an enrobing machine, so in our case, dipping will have to suffice. 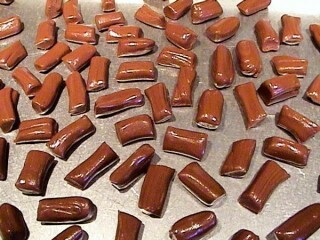 The caramel Twix was introduced in 1977, and peanut butter Twix came along in 1982. Some are confused by the brand name M&M/Mars. The company is a snack division within the parent company Mars, Incorporated, which produces food products around the world as diverse and Uncle Ben's Rice and Kal Kan dog food. When the founder's son, Forrest E. Mars, Sr., returned from England where he had established the first canned pet food business in that country, he formed a company in Newark, New Jersey, to make small chocolate candies that could be sold throughout the year and not melt in the summer months. Those were the first M&Ms. The company, called M&M Limited, consolidated with the other Mars confectionery businesses in the United States in 1967 to form M&M/Mars as it exists today. The Mars Milky Way bar was the first chocolate-covered candy bar to find widespread popularity in the United States. It was developed in 1923 by the Mars family, and became so successful so quickly that the company had to build a new manufacturing plant in Chicago just to keep up with demand. 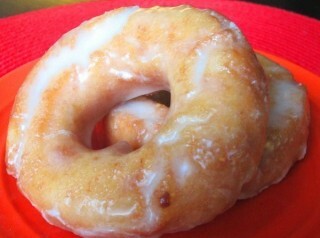 Youll need a heavy-duty mixer for this recipe. Nougat is an important ingredient in the 3 Musketeers Bar, as well as in many other candy bars created by M&M/Mars. Nougat is made by mixing a hot sugar syrup with whipped egg whites until the solution cools and stiffens, creating a frappe. Other ingredients may be added to the nougat during this process to give it different flavors. In this recipe, you'll add chocolate chips to create a dark, chocolaty nougat. But the 3 Musketeers Bar wasn't always filled with just a chocolate nougat. In fact, when the candy bar was created back in 1932, it was actually three pieces with three flavors: vanilla, strawberry, and chocolate. After World War II, the product was changed to a single chocolate bar because that was the favorite flavor, and customers wanted more of it. Thankfully they didn't change the name to 1 Musketeer. You'll need a heavy-duty electric mixer for this recipe. It's time to clone America's best-selling brand of instant macaroni & cheese. This recipe is for the "Deluxe" variety of this popular product—that is, the one that comes with an envelope of thick cheese sauce, rather than the dry, powdered cheese. I think the "Deluxe" version, with its two-cheese blend, is the better tasting of the two. 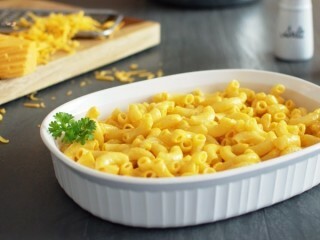 Now, with this Top Secret Recipe, you can make creamy macaroni and cheese that tastes like Kraft's original at a fraction of the price of the real thing. Menu Description: "Tossed with orange peel and chili peppers for a spicy/citrus combination." Several of P.F. Chang's top-selling items are similar in preparation technique: bite-size pieces of meat are lightly breaded and wok-seared in oil, then doused with a secret sauce mixture. This PF Chang's copycat recipe is made the same way. The heat in the citrusy sauce comes from chili garlic sauce, which you'll find in the aisle with the Asian foods in your supermarket—the rest of the sauce ingredients are common stuff. The orange peel is julienned into thin strips before adding it to the dish. Since the flavor from the peel is so strong, we won't need to add it until the end. Cook up some white or brown rice to serve alongside this dish and get the chopsticks ready. 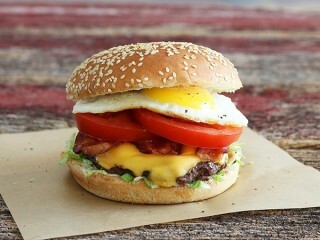 Menu Description: "This is the aristocrat of all burgers because we crown it with a fresh fried egg. In addition, topped with three strips of hickory-smoked bacon, American cheese, crisp lettuce, tomatoes and mayo." This delicious burger has been on Red Robin's menu since the restaurant first opened in 1969 and it's still a popular pick today. 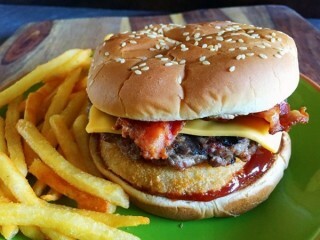 The recipe is a classic bacon cheeseburger, except for one huge difference: there's a jumbo fried egg stacked in the middle! If you've never had an egg on a burger before I encourage you to give this Royal Red Robin Burger copycat recipe a try—it's a really great burger. Red Robin serves over 36 million burgers a year and each of them is sprinkled with the secret seasoning blend called "Red Robin Seasoning." You can buy a bottle of the seasoning in the restaurant, or you can just make your own with the Top Secret Recipe I've included below. 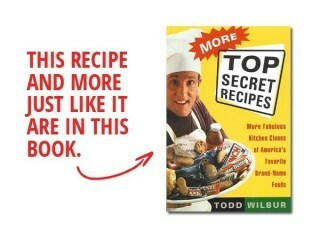 This recipe for the seasoning is an improved version of the formula found in Top Secret Restaurant Recipes 2since tomato soup mix is hard to find these days. I discovered that a little bit of the dry mix in a box of Italian Lasagna Hamburger Helper is the perfect way to get dehydrated tomato and a few other tasty ingredients into the seasoning blend. Nicknamed "Sliders" and "Gut Bombers," these famous tiny burgers were one of the earliest fast-food creations. It all started in 1921 when E.W. Ingram borrowed $700 to open a hamburger stand in Wichita, Kansas. Ingram chose the name White Castle because "white" signified purity and cleanliness, while "castle" represented strength. permanence, and stability. White Castle lived up to its name, maintaining that permanence and stability by growing steadily over the years to a total of 380 restaurants. Ingram's inspiration was the development of steam-grilling, a unique process that helped the burgers retain moisture. 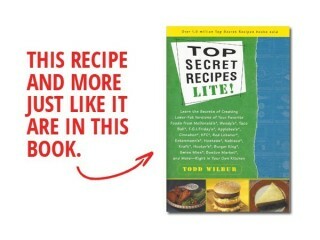 The secret is grilling the meat over a small pile of onions that give off steam as they cook. 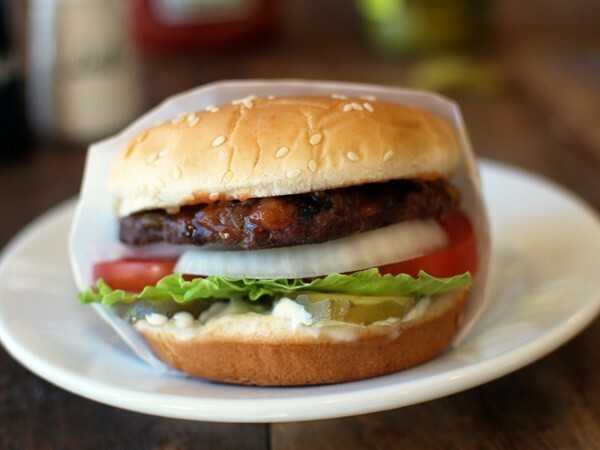 Five holes in each mini-burger help to ensure that the meat is completely cooked without having to flip the patties. Today customers can buy these burgers "by the sack" at the outlets, or pick them up in the freezer section of most grocery stores. The small slider buns used by White Castle are square. We can make something similar by slicing hot dog buns—you'll get 2 small burger buns from each hotdog bun. You may also use small hamburger buns and slice them into 2x2-inch squares.